N.B. We will be re-running this ramble as part of our National Ramble Programme next year! This was to be my first foray into running a ramble, so I was quite nervous leading up to the day. I discovered the ramble earlier in the year printed in a local free magazine. It looked very pretty and relatively easy so my husband, Pete, and I decided to have a go at it. I had plenty of support from John and Val leading up to the day of the ramble. This helped to quell the nerves! 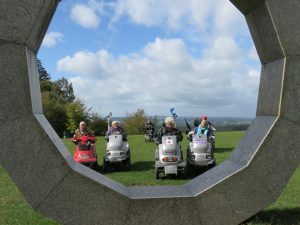 The ramble was on the Longleat Estate, Heaven’s Gate has wide reaching views over Longleat House and grounds, as well as across the Somerset countryside. On the day, we had 6 scooters and 3 walkers. Which was a nice number for my first attempt at a ramble. When we arrived at the start point, the weather was a little showery but it had stopped by the time everyone had arrived. The start of the ramble took us around Shearwater lake. It was fairly quiet. The lake had blue green algae, so it was a particularly vibrant green. This did make it look very strange. When we had done the reccy’s, there had been a lot of wild fowl birds, unfortunately we didn’t see many. We are not sure if it was due to the water or they had left to fly south for the winter. The next part of the ramble went through the forest, heading up to the car park for Heaven’s Gate. We stopped for a coffee in a sunny spot as it was quite a chilly day. There are a variety of different trees, mainly fir trees though. After crossing the road by the car park, you are led down, through a beautiful arboretum leading you to Heaven’s Gate. The arboretum and Heaven’s Gate viewpoint, were designed by Capability Brown. You reach Heaven’s Gate through two very accessible gates. You are greeted by stone sculptures. These were commissioned for the Millennium by Lord Bath. Paul Norris, spent 2 years at Longleat creating the stone sculptures. The stones have been designed to be ambiguous, so that you can use your imagination as to what they may be. 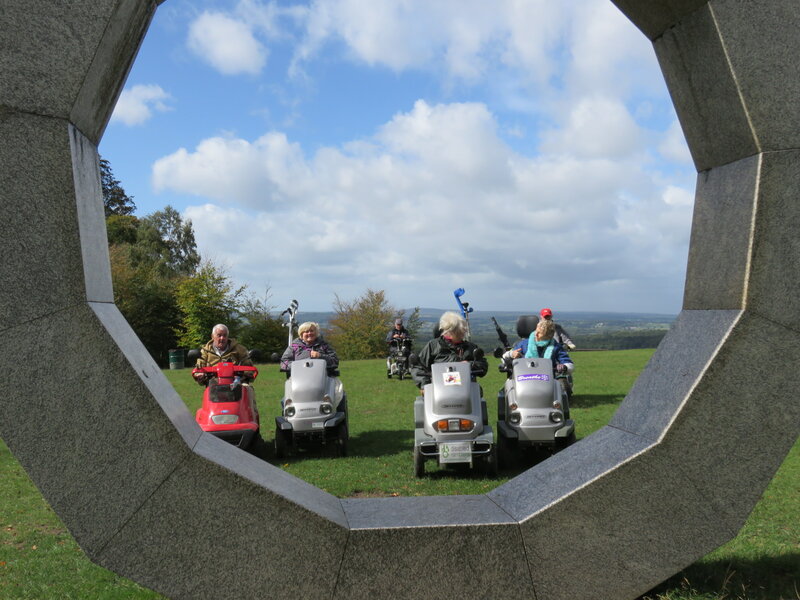 They are also, set back from the view, Paul wanted them to be a greeting to the stunning view, so were set back from the views over Longleat. The view is stunning and you can see for miles. We were due to have lunch at Heaven’s Gate, but as it was very exposed and windy, we decided on having lunch in a sheltered spot in the arboretum. We went back via the same route and finished off in the Shearwater Lake café, for a well-earned cuppa and cake. This entry was posted on 03/10/2018 at 12:56 and is filed under DR Rambles. You can follow any responses to this entry through the RSS 2.0 feed.